"A Profit Center for your Business"
Cigars provide a significant revenue source for numerous businesses across many industry sectors. Specialty Cigars International, Inc. is the leader in "On-Premise" cigar distribution, and can assist you in building your revenue source by customizing an on-premise cigar program to fit your individual needs. 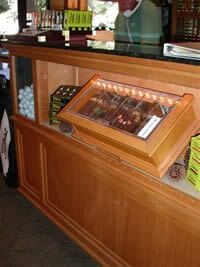 Our veteran sales staff have succeeded in creating thousands of successful cigar profit centers over the last 20 years. Let us be your cigar expert and we will keep you appraised of the most current trends, retail price points and brands to fit your needs. The Specialty Cigars International, Inc.
Deluxe wood and jeweler grade acrylic humidors are provided to all customers at no charge. 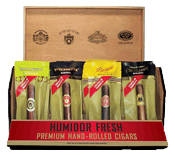 You may choose from 5 sizes of humidors, ranging from beverage cart humidors, which hold 45 cigars, to our 6-selection humidor, holding up to 150 cigars. The consistency of the cigar supply, including over 50 national brands and 900 sizes of cigars is the key to high inventory turns and profitability. 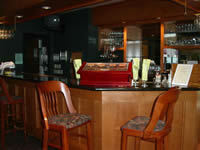 Specialty Cigars features General Cigar products, including the industries #1 selling cigars, Macanudo and Partagas. Specialty Cigars International, Inc. holds the state wholesale tobacco tax license, collects the tax from you and remits it to your state in accordance with individual state laws. We also provide information regarding retail licenses/permits that may be required by your state or local jurisdiction. All businesses must be in compliance with state tobacco laws and Specialty Cigars will monitor each customer monthly to insure compliance. You will receive a service call every three-four weeks to maintain stock levels, and insure the humidors are being cared for properly. An individual data base will be established to record “best sellers”, retail price points, and inventory levels to be used for future purchases. All cigar orders are shipped within 24 hours from our Bend, OR or Dallas, TX distribution center, and Specialty Cigars pays the freight charges for UPS Ground service for orders over $500. 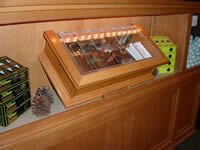 Educational materials are provided to help advise the customers when purchasing cigars. Each cigar selection is clearly labeled in the humidors to make the customers aware of the type of taste they should expect, the country of origin, and the ring gauge of the cigars. And, yes we have accessories to compliment you cigar sales!